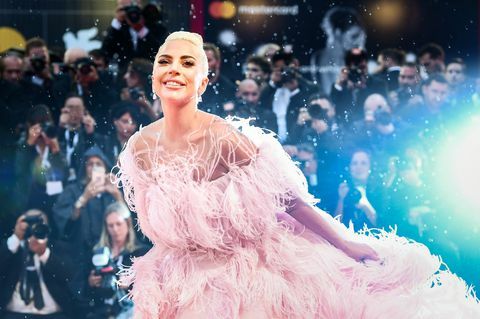 A Star is Born, which represents star Bradley Cooper’s impressive directing debut, world premiered (outside competition) at the 2018 Venice Film Festival. This is the third remake of David O. Selznick’s 1937 film, which starred Fredric March and Janet Gaynor. George Cukor turned the movie into a musical drama in 1954, featuring the incomparable James mason and Judy Garland in her most fully-realized (Oscar-nominated) performance. In 1976, Streisand used the story as a star vehicle, changing the local from the movie industry into the music world, and playing against leading man-singer Kris Kristofferson. 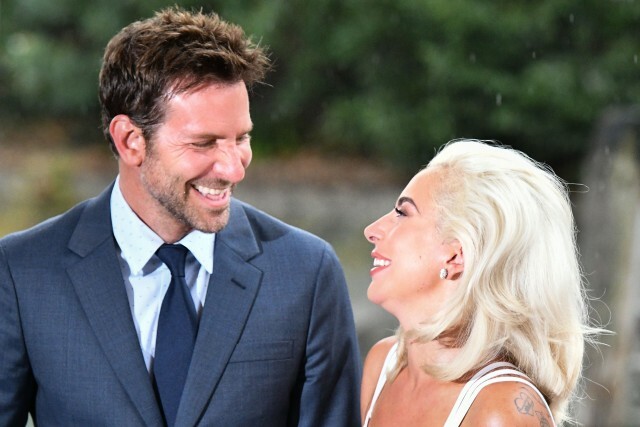 Bradley Cooper: For sure, it’s much more vulnerable. Cause anything you don’t like, I have to take the blame. It’s true, the buck stops with me, the sound of the car taking off, the engine, every little moment, everything, I have to take responsibility. So there’s something beautiful in that I got to make the movie I exactly wanted to make. But then last night I gave it away, it’s yours now, and it’s a vulnerable thing to do. It’s necessary, I don’t want to create content in a box, I wanted people to experience it. But it’s hard. 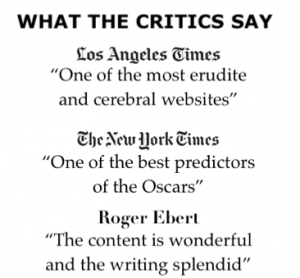 BC: No, I don’t like reading reviews. I learned that a long time ago. BC: Mario Lanza, that’s why I played him last night on the carpet. 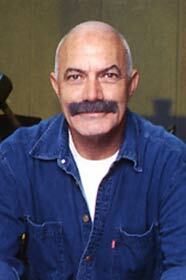 I grew up in Philadelphia and he is a Philadelphian and he’s an Italian-American and he grew up in Philadelphia. And his story is very much the tragedy of “A Star is Born” and I don’t know if any of you are familiar with it, but he died at 38 in Rome I believe. And he shot to stardom, he played Caruso, an American in Philadelphia, he played Caruso. So when I grew up, my mother is Italian, we grew up in the family, he was a hero for us. So Opera was always on in my house. I would say, I remember Radiohead playing “Saturday Night Live” with the “Kid A” album. I remember watching it on television thinking that my life just changed and I never heard anybody sound like that. Thom Yorke is my hero. BC: That’s like asking me what my favorite film is. There’s so many man. I would say right now I have fallen in love with Gustav Mahler. There’s an adagio in his Fifth Symphony, and I am kind of blown away by him right now, due to my parents. 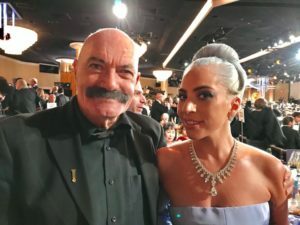 Lady Gaga: I remember very fondly as a child, I must have been six years old, and I still remember my father playing me Bruce Springsteen’s “Thunder Road” for the first time. And he was swinging me around in his arms and he was dancing with me and he would cry and look me in the eye and say, I just never want you to grow up, I just want you to stay this little, you are my baby girl and I love that song, to this day that song sticks with me, and I am a huge Springsteen fan. I mean, a massive one. My father also played Pink Floyd and Billy Joel for me. And there was Jazz playing throughout the house as I got older and I played classical music when I was a kid. 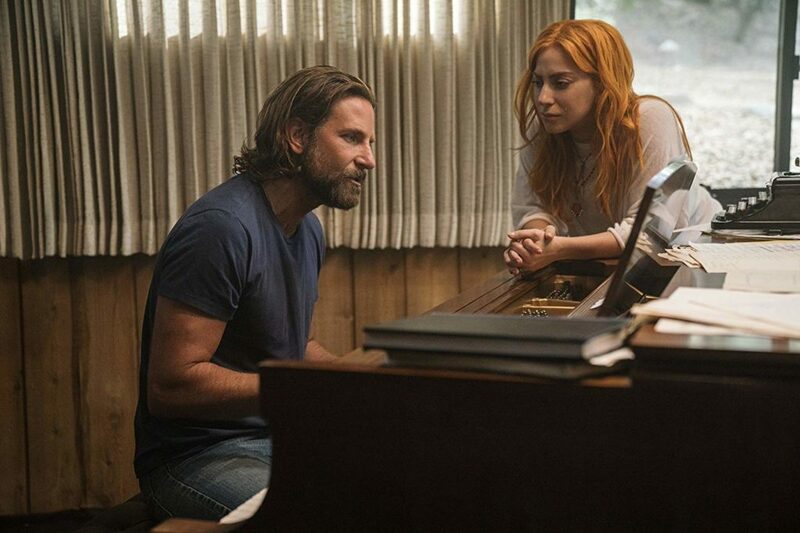 LG: I grew up loving music and this was just such a tremendous honor for me to be in this film, because I really believed that when an artist is moving into a new medium, if they have been studying and gestating like a petri dish just so long, their talent and studying their first foray when they come out, it’s like an explosion of talent. And I thought to myself, my gosh, I can’t believe he wants it to be me. And I am just so honored that I got to be in this film, he is a tremendous director, tremendous, completely focused on set, such a visionary, so inspiring, so passionate and yet so free and so sacred that these scenes that we did together and we did separately, the ones I got to watch, it was one of the most fulfilling artistic experiences of my life, if not the most. BC: I don’t even think about it. That’s interesting, I never thought of that, but yeah, I have no interest in their personal lives. I don’t need to know if Thom Yorke has kids or whatever. It certainly helps to contextualize the time in which he was making music and what was going on, that’s true. But that is sort of the time. But yeah, I have to say, my first, I don’t even need to hear lyrics. The thing about Radiohead is often you really can’t understand what he is saying, but it doesn’t matter cause of the emotion. And REM were like that too and REM’s hits were actually when they had a linear, you understood what they were saying. But Michael Stipe’s voice, he’s got one of the best voices we have ever heard, I think. And the songs, it’s only when it’s like “Losing My Religion,” okay, I understand what that’s about, so it’s always really melody. But then somebody like Bruce Springsteen or Neil Young, you really hear the words and then you hear the story. BC: The wedding photo in the house of my grandparents, my grandmother made the wedding dress. So when they walk up the stairs, those are my grandparents. And Campana is my mother’s maiden name. Campano, they changed it when they immigrated to the U.S. My grandfather was from Naples. It’s part of my DNA. I don’t think I could get Italian citizenship, because I would be third-generation American. BC: I don’t think it’s about being an actor, I don’t know any kid growing up that didn’t want to be a rock star. I mean it’s even a term that’s thrown around if you write a great article and it’s like oh, she’s a rock star. It’s a term that is identified with any profession. So hell yeah, I always wanted to be a rock star when I was a kid. Lady Gaga: You mean when lightning struck the theater? Well, you could see it that way and I know Bradley sees it in whatever way he sees it. But for me it was like a sign from God. I mean the elements were with us, and it was a beautiful moment. Everybody stayed in the theater…Everybody was so kind and you could tell that they were entrenched in the film and they couldn’t wait to see more, and it worked out perfectly. BC: The great thing was you are reminded that it’s a communal experience. The lights come up and you are like oh yeah, there’s hundreds of people and we are all watching this thing together. That’s what I loved about what it reminded us of. LG: It made it feel even more special, cause we got to really see the audience and have a very human moment with them. BC: I remember we tested “Silver Linings Playbook” for the first time and the bulb busted and it was like oh my God, but that was the highest testing score we did. So you never know. LG: And it happened first with Scorsese for “Goodfellas” so not a bad omen. BC: It was incredible what the festival did, the second generator didn’t work and they were able to get it up. It was a testament to this festival. LG: They did a great job, fantastic. LG: It’s different. It’s very vulnerable. Because you see everything and your face is so big and your body is so big, it’s larger than life and it’s very different from watching myself on “American Horror Story” on the small screen. It was overwhelming and emotional, but I just feel so incredibly grateful, because I have such an incredible man by my side, a companion, a friend, an incredible film director, an incredible actor. And I feel like from the moment the film starts, it’s just so clear that he is a rock star and he is the real deal. 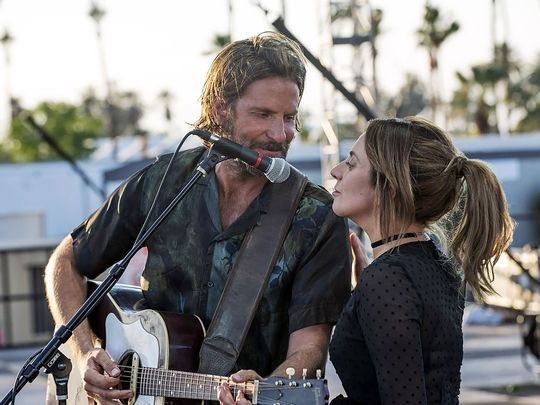 And I remember at one point we were talking, and we said something like, in the first 10 minutes of the movie, we need to buy into the fact that he is a musician and I am an actress, and that has to happen within the first 10 minutes of the film for it to work. 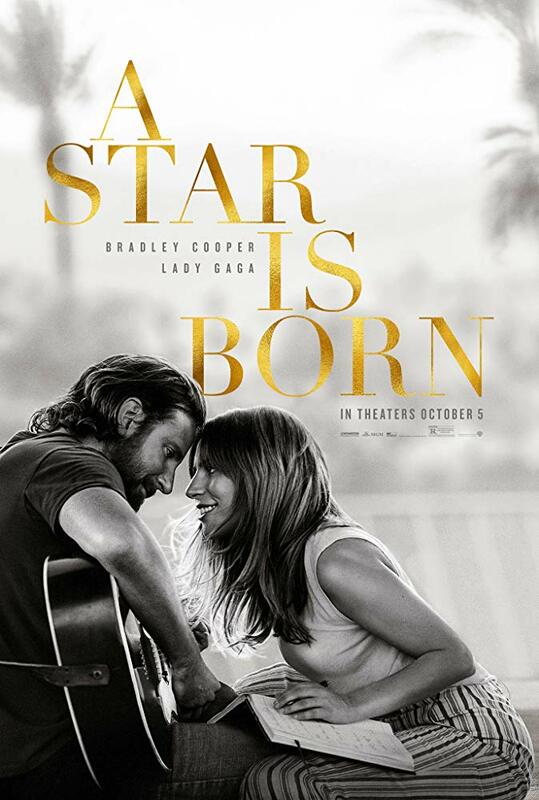 Star Is Born–Drama or Musical? LG: A drama with music. LG: I am happy with my nose. Now more as a woman yes I am. As a child I was much more insecure about my nose in school. I come from an Italian immigrant family and I looked very different than a lot of the girls I went to school with, blonde, blue eyes, very perfect symmetrical faces. But as I got older, I grew to appreciate more of my heritage and be proud. But in this movie, he really challenged me to take my makeup off and to have my natural color hair. And this was essential and I really feel like I became her and there was no way for me to stop being her during the process of filming, and even in preparation. Cause I actually died my hair quite a while before we started filming to get into the rhythm of who she is. So I am proud. I actually never told anyone this and I don’t know why, I forgot, but they actually, a record executive suggested that I get a nose job before I put out my first album. And I didn’t do it. BC: Well there are two different answers. I mean, I can only answer for myself, I think that is a personal choice and someone can only take a part of your soul if you give it to them. I live a very normal life and I choose to and it’s hard work to, but it’s the only way for me. That’s how I look at it and I don’t think about it. And honestly outside of this Venice Film Festival and I just spent a month with my family in Paris and we live in New York and we take the subway and go to the park. And paparazzi is an issue, but at some point you have to, I feel different with a kid, but who knows, talk to me within a year, I might hit somebody, who knows? No, but you just have to deal with it and it becomes a part of your reality like anything else. LG: Bradley is such a good friend and I confide in him a lot about how I feel about fame. I am not adjusted to it. And for me the cameras do a lot of times feel like an intrusion and I am still trying to navigate my unique existence on this planet. And I think some of it is because of my upbringing and my mother, she was just always dressed so beautifully and when I was a child she always did her hair and I used to watch her do her makeup and she never left the house unkempt. So I feel pressure from my family, to be always seen at my best. So I struggle with it, I do struggle with it, and that’s the honest truth. LG: When I sing, I feel a vibration throughout my entire body and then a release. I feel my whole body vibrate. It’s for me a tremendous release and I just feel a vibration throughout my entire body and a relief. It’s whatever I have to say, it’s like saying something but amplified times a million. LG: I just thought the dress was beautiful and I sent Bradley pictures. It was daring: The rain could have made it look a wet Big Bird. LG: I love acting, and it has whetted my appetite, but I am very spoiled, I had a tremendous director, a tremendous companion, a tremendous filmmaker, a tremendous actor by my side to guide me through this process. So I think for me, it’s more about doing the right things, and doing things that I really, truly believe in that touch my soul, because this really touched my soul working with Bradley. And he inspired me every single day. I don’t think I could work on a film with someone that didn’t inspire me every single day.